Engadget is reporting that Amazon began rolling out a new Alexa feature for U.S. residents Monday that provides the option to request long-form news from Bloomberg, CNBC, CNN, Fox News, Newsy and NPR. Users can ask Alexa to “tell me the news” or to “play news” from one of the listed outlets in order to receive detailed audio from all providers, even video from CNBC and Newsy on an Echo Show. Users also have the option to skip the stories if they like. All U.S. Alexa devices will have access to the new feature by Monday, April 15th. The most popular daily and monthly use case of smart speakers is listening to music. This form of content consumption is only just ahead of asking smart speakers questions. 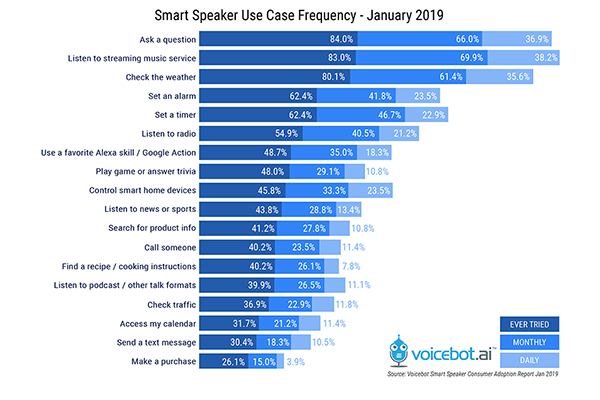 Voicebot research from the Smart Speaker Consumer Adoption Report 2019 found that ‘listen to radio’ is the sixth most popular monthly and daily use case, at 40.5% and 21.2% respectively. ‘Listen to news or sports’ is the tenth most popular monthly and daily use case, at 28.8% and 13.4% respectively. This data indicates that although news listening may not be the most popular use case of smart speakers, it certainly is important in pushing the increasing adoption of smart speakers. Listening to radio having a higher use case frequency than listening to news also indicates that users don’t just want to have short summaries that Flash Briefings offer – they are interested in longer forms of audio-based entertainment. Amazon wants to increase the user engagement of Alexa and providing users with longer form content can only increase the user time spent listening and engaging with Alexa. An interesting aspect of this feature will be how the rollout and updates are handled and how many news organizations will join. Right now, only six news organizations are offering content, which does not provide a lot of options for users. But, one can expect more will follow as the audience size grows. Voicebot Says and Voice Daily Flash Briefing Come to Alexa in Australia, Canada, India, and the U.K.